The survey of 1'299 UK adults revealed that we are nation of shower songbirds, with a massive 86% preferring to practice their chords in the shower over any other place. In fact, the bathroom was voted the ultimate stage for Brits who enjoy belting out a tune, with 51% saying they prefer to sing their heart out in the shower over any other place. The car and the kitchen came in second (19%) and third place (14%). 1 in 3 believe they have a great singing voice, while 47% say they sound their best when belting out their favourite hits in the bathroom. The survey also quizzed Brits on their favourite shower anthems, and found Madonna’s 1984 hit ‘Like a Virgin’ took the top spot. This was followed by Whitney Houston’s ‘I Wanna Dance with Somebody’ and Queen’s ‘Bohemian Rhapsody’. In fourth place was the famous Oasis hit ‘Wonderwall’, ahead of ‘Dancing on the Ceiling’ by Lionel Richie. 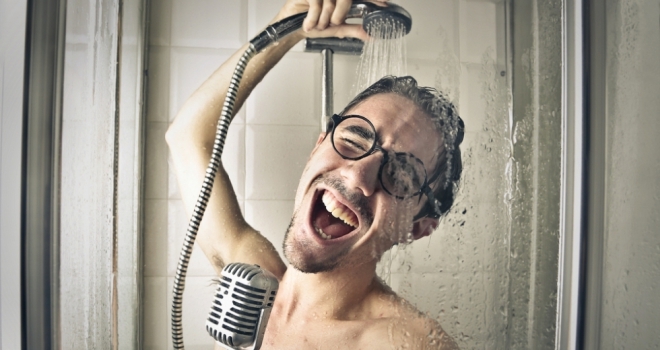 Despite singing in the shower being a pastime for Brits, a quarter of Brits (24%) say the habit has caused arguments after annoying others living in the house. Of those who regularly sing in the shower, it is males who prove to be the biggest shower songbirds (53%), followed by females (47%). Mark Kelly, marketing manager at Furniture123.co.uk said: ‘With bathrooms becoming more and more style-focussed, it’s inevitable that people are going to be increasingly enjoying the time they spend in there. As a result, they’ll be happier during the time they spend in there, whether unwinding in the bath or freshening up in the shower. Singing is an obvious way of expressing happiness and what better time to do that than at the start or end of your day – which are typically the most common times to freshen up.